If your client is implementing Salesforce in their organization, it means that they have already invested a lot of time and money in making sure the solution works well for your business. As per a survey was done by Merkle Group Inc. in 2017,63% of CRM initiatives fail (https://www.dmnews.com/customer-experience/news/13059003/63-of-crm-initiatives-fail). 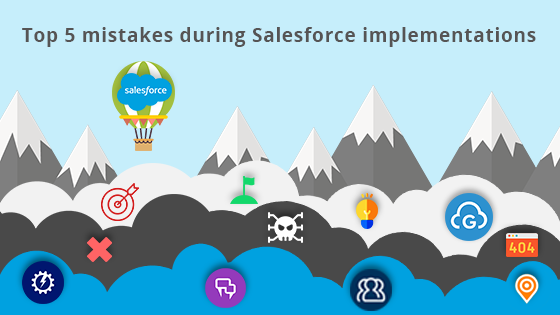 To keep your Salesforce org out of CRM graveyard, it is important to be aware of mistakes frequently made in implementing Salesforce. As with any project, there are a lot of variables, however, there are some common pitfalls that open up while implementing, adopting, transforming and making changes in an organization to make it a Salesforce organization. Hence it is important to know about them before implementation starts. You must have enough trained Salesforce administrators, developers and analysts to support the solution you would provide to your client in order to complete the project on time. Most organization do not invest in resources as required. The availability of trained Salesforce resources is less than the demand in the market hence hiring trained resources at short notice is a challenge. Also, some make a mistake of not having end users ready to test the functionality as it is being deployed in the sandbox. • Keeping skilled resources on the bench is a costly affair hence may be difficult to get approval from the management. One of the leading causes of IT project failure is poor system requirements. Requirements establish the needs of all stakeholders that the new software would meet. The elicitation is the first step of the requirement process. The requirements need to be analyzed, documented and managed throughout the project. Documenting the requirement is key to ensure that the end product is developed correctly. Sometimes the client has not enlisted the requirements in “must have” and “good to have” in cradle-to-grave format. Also, a big mistake is that the requirement is not prioritized by the client. Improperly managing Data Migration, integration and maintenance properly is one of the biggest mistakes that organizations face while implementing Salesforce. • Master list of data does not exist. All stakeholders are maintaining their own data. • Data ownership does not exist in the client organization. Approach to an implementation of Salesforce for an organization is usually based on the philosophy of the management. However agile or iterative approach works best for most of the cases. A prototype is built and it is tweaked based on user feedback. Implementing a solution across the organization will require much more efforts but this approach translates into quicker wins. In fact, many organizations prefer to buy a small number of licenses for a department and optimize Salesforce in a small trial group and then extend to the entire organization in a phased manner. • Too much is tried to achieve in one shot, can risk the entire implementation. • The user might change the priority of requirements while validating the model. Project Plan needs to be followed. It is a well-known fact that to make business more effective, productive and profitable new technology is a great enabler. However, for technology to work best, process change is needed. You need to have a modern sales process, customer support processes, data management processes and more in order to implement Salesforce effectively. Sometimes this also involves the change in team structure and responsibilities. Staff adoption and training is a significant challenge across all types of organization. In an early stage user considers entering data as an additional chore and not as an enabler for making work simpler and easier. Sometimes due to lack of training even if Salesforce has been implemented successfully, the user may not know how to use it even if they want to.